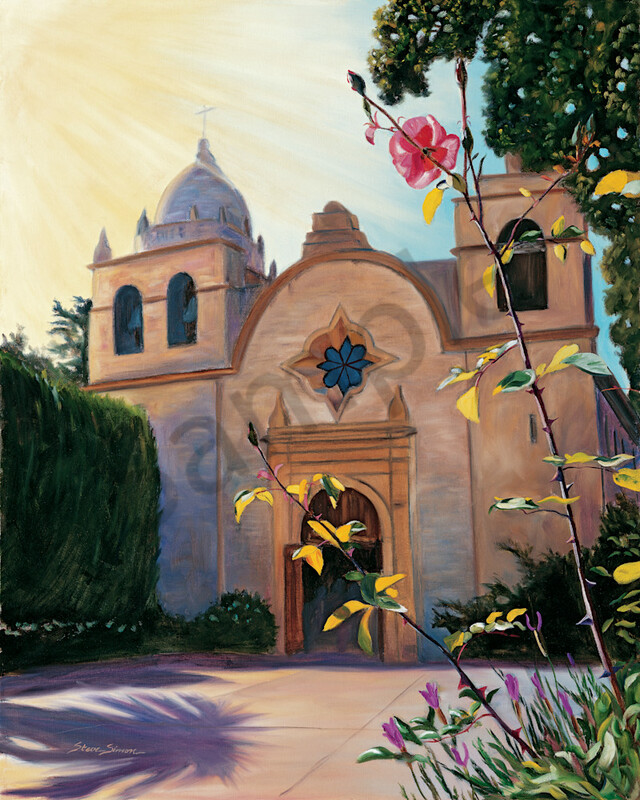 Oil painting of the Carmel Mission in Carmel, California. Mission San Carlos Borromeo de Carmelo, also known as the Carmel Mission, is a historic Roman Catholic mission church. It was the headquarters of the padre presidente, Father Fermin Francisco de Lasuen. It was destroyed in the mid 1800's and restored beginning in 1884. It remains a parish church today. The mission was originally established in Monterrey in 1770. It was named for Charles Borromeo, Archbishop of Milan, Italy. In 1771, Father Junípero Serra petitioned to relocate the Mission to its current location. "Mission Carmel" was Father Serra's favorite mission. Upon his death on August 28, 1784, he was interred beneath the chapel floor. Mission Carmel has been designated a National Historic Landmark by the National Park Service. In 1987, Pope John Paul II visited Mission San Carlos Borromeo de Carmelo as part of his U.S. tour.